Freechoice: Board a sampan to visit Cai Be before stopping at local cottage industries and a French colonial or traditional Vietnamese house. Alternatively savour morning tea at a French colonial house or choose to stay on board for your special Scenic Freechoice activity. Freechoice: Visit the farmers on Evergreen Island and enjoy a ride in a Xe Loi. Alternatively, walk through Chau Doc market and visit a family-operated fish farm or visit Tra Su Bird Sanctuary. Freechoice: Journey to the Killing Fields and tour Tuol Sleng, the former school which was converted to the Khmer Rouge’s main prison, or take a guided tour of the local food market before joining a hands-on Khmer cooking demonstration. Alternatively, explore by tuk tuk Phnom Penh’s colonial buildings and the Central Market. Freechoice: Discover Banteay Srei and visit the Landmine Museum or admire the skills on display at Artisans D’Angkor. Alternatively, cruise on Tonle Sap (seasonal), take a tuk tuk ride to all the markets or take a tethered balloon ride above Angkor Wat. 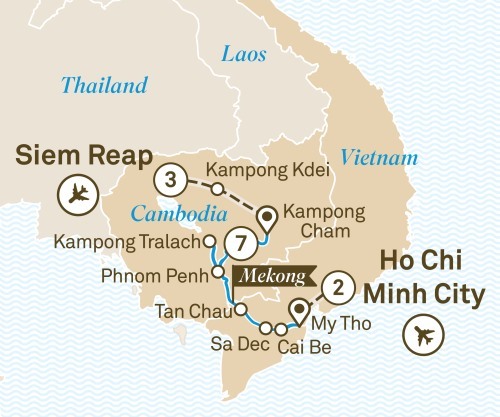 Breathe in the essence of South East Asia during this enchanting journey from Siem Reap to Ho Chi Minh City including Phnom Penh, Tan Chau & the Mekong river. Breathe in the essence of South East Asia during this enchanting journey from Ho Chi Minh City in Vietnam to Siem Reap in Cambodia. From the ancient hilltop pagoda of Wat Hanchey to the famous Silver Pagoda in Phnom Penh, Scenic will unveil a multitude of experiences that will allow you to appreciate this magnificent waterway.